This is the second part of our multi-part series which aims to be the most comprehensive compilation of well-sourced, credible information about O.J. Simpson and domestic violence. Part two focuses on the January 1, 1989 incident. O.J. Simpson and Domestic Violence: A Multi-Part Investigative Series. A call to 911 was made from O.J. Simpson’s estate located at 360 N Rockingham at 3:58am on January 1, 1989. The 911 dispatcher who answered the call, Sharon Gilbert, had no dialogue with the caller but heard a woman scream and what she believed to be an altercation occurring in the background. Although she never spoke with whomever made the call, based on what she heard occurring in the background Gilbert, rightly, dispatched officers from LAPD’s West Los Angeles station to respond to the potential incident. LAPD Detective John Edwards (who at the time was a training officer for West LA Patrol) and his partner, Officer Patricia Milewski, arrived to 360 N Rockingham Avenue at around 4:15 AM. Simpson Estate: 360 N Rockingham Ave in Los Angeles, California. Detective Edwards testified that “then a woman came running out of the bushes to my left, across the driveway. She was a female Caucasian, blond hair. She was wearing a bra only as an upper garment [bra] and she had on dark — i believe it was a dark lightweight sweatpants or night pajama bottom.” When the woman was directly across the gate from the detective she “started yelling, “he’s going to kill me, he’s going to kill me.” then she pressed the button which allowed the gate to open and then she ran out [to the other side of the gate] again yelling “he’s going to kill me.” Detective Edwards asked the woman “‘well, who is going to kill you?’ she said, ‘O.J.’” The detective responded “‘O.J. who? Do you mean the — the football player, O.J. the football player?’ and she said, ‘yes, O.J. Simpson, the football player.’” The woman then told Detective Edwards that she was Nicole Simpson and O.J. Simpson was her husband. As this dialogue was happening the gate which Nicole exited, which was on an automatic timer to close after a set amount of time, automatically closed. O.J. walked back to the house and Detective Edwards returned to his LAPD cruiser and used the radio to request that his supervisor to respond to the scene. As he was doing this, Detective Edwards explained that he “heard the gate open and I saw somebody come through the gate. It was a female.” The female “went directly to the right rear door of the police car.” The female “opened the right rear door and reached in and grabbed Nicole Simpson by the right arm and started pulling on her and saying something.” The detective identified the woman’s voice as being the same voice that answered the intercom – Michelle the housekeeper. The detective testified that he “Pulled her away from the car and closed the door after I saw and heard what she was doing.” He then advised Michelle of “148 of the penal code, interfering with a police officer’s investigation” and told Michelle to leave. She complied and returned to the house. As Detective Edwards was saying this to O.J. the supervisor that he had requested, Sgt. Glenn Varner arrived to 360 N Rockingham. Detective Edwards then walked over to the supervisor to explain to him the details of the situation. Detective Edwards and his supervisor, Sargent Glenn Varner, pursued the Bentley but since both men were out of their squad cars when the Bentley exited 360 N Rockingham, their pursuit was unsuccessful. While Mr. Simpson was charged with domestic abuse, he was never arrested by LAPD. Understanding the importance of documenting her injuries via photograph, Detective Edwards testified that he “asked her if she would go to West LA Station and have Polaroid photographs taken of her real quickly.” Nicole said yes. While at West LA Station, Detective Edwards had his partner, Officer Patricia Milewski, take Nicole into the women’s restroom to “see if she had any bruises or marks on her back” or elsewhere on her body. Officer Milewski found no additional bruises, marks or other injuries on Nicole’s body. While this claim is titillating and sensational, it is rooted in truth? Considering that Nicole never mentioned it to other LAPD personnel or the prosecutors from the City Attorney’s Office, it seems highly unlikely that Detective Edwards claim is accurate. After completing the photographs and examination at the West LA Station, Detective Edwards drove Nicole back to the Simpson estate at 360 N. Rockingham. Upon arrival Nicole was greeted by housekeeper Michelle Abudrahm. Despite the earlier incident when Michelle tried to drag Nicole out of the police car, Detective Edwards made no effort to speak with Michelle. In fact, although she was a witness to the incident, Michelle Abudrahm was never interviewed by LAPD. From a legal standpoint, the most significant thing that occurred that night was Nicole signing the crime report [See the subheading above: “Nicole’s Statement to LAPD”]. Her signature on the report legally obliged LAPD to bring their domestic abuse case against O.J. to the next step in the process. Shortly before noon on January 3, 1989 Detective Farrell called 360 N Rockingham. Christopher Darden: Did you ask the defendant about the injuries Nicole Brown sustained? Darden: Did he deny causing those injuries? Farrell: No, he did not. Darden: Did he admit causing those injuries? The following day, January 4, 1989, per Detective Farrell’s request, Nicole met with him at the West LA Station. During direct examination by prosecutor Christopher Darden, Detective Farrell recounted his meeting with Nicole: “I explained to her what was going to happen in this case” and “explained to her the procedures that would happen. I reviewed the original police report with her and asked her to review it. We reviewed it together. I asked her, ‘Does this accurately depict what happened over the weekend?’ She said, ‘yes.’ I said, ‘Is this your signature on the report?’ She said, “Yes, it is.” Farrell informed Nicole that he would use this information to preparing the case for a prosecutor from the City Attorney’s Office. Johnnie Cochran: Prior to Mr. Simpson entering a plea to this misdemeanor charge of 273.5 p.c., did Miss Nicole Brown Simpson indicate a desire to drop all charges against her husband and have a city attorney hearing? Cochran: Let me just back up. In your report, you spelled it out. On January 4th, ’89, you contacted miss Nicole Brown Simpson, at that time, she told you she did not want to prosecute, but would welcome a City Attorney hearing. That’s an informal hearing at the city attorney’s office, right? Cochran: Sit around with the City Attorney and you discuss this matter, right? Cochran: And so thereafter, you told her that the City Attorney could make their own judgment, they may want to go forward with the charges whether or not she wanted to prosecute or not. Is that what you said? Jeffrey Toobin, author, The Run of His Life. Per the request of the prosecutors, Detective Farrell asked his fellow officers at West LA Station if they had ever responded to an incident at 360 N. Rockingham or involving O.J. Simpson. The Detective asked a lot of other cops but only one told Farrell that he had responded to an incident at the Simpson estate. Detective Farrell asked this officer to please write a memo to documenting his recollection of the incident he responded to at 360 N. Rockingham. During the fall or winter of 1985 I responded to a 415 family dispute at 360 N. Rockingham. Upon arrival I observed two persons in the front of the estate, a male Black pacing on the driveway and a female wht [White] sitting on a veh [vehicle] crying. It seems odd to remember such an event but it is not everyday that you respond to a celebrity’s home for a family dispute. For this reason this incident was indelibly pressed in my memory. 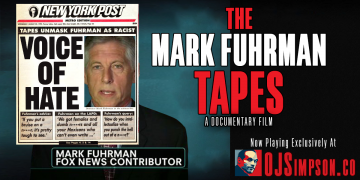 The author of the above memo is Detective Mark Fuhrman. In his memo Mark Fuhrman wrote that “this incident was indelibly pressed” in his memory, however there is solid evidence that the convicted perjurer’s memory is flawed in matters of the recollection of time and date. Daniel Petrocelli: What was the year? O.J. Simpson: I don’t know, but I know if wasn’t 1985. Petrocelli: How do you know that? Simpson: Because they said it was in the fall and I recall it being in the fall because Nicole was pregnant in the fall of 1985, was the first year we were married. We never had any arguments that year. After she had the baby, she had a C section, so she wouldn’t have been out, couldn’t get her for the next two years to go out having drinks with friends, and this incident had taken place after she had returned home from having drinks with friends. So certainly–and Nicole– certainly was not the fall of 1985. Petrocelli: Well, based on what you just said can you fix the time for us? Simpson: I believe it was 1984. LAPD never interviewed housekeeper Michelle Abudrahm about the incident between O.J. and Nicole that she witnessed. LAPD never entered the house and was unaware that there was an additional witness inside the house, a nanny. On on March 30, 1989 the Los Angeles Times reported that Simpson had plead “innocent” to the charges. Short LA Times story about O.J. Simpson’s Initial Court Appearance where his attorney entered a plea of not guilty. O.J. Simpson’s attorney, Howard Weitzman, arranged a deal with prosecutors for Mr. Simpson to plead “no contest” to the charge in return for a sentence of probation, counseling and community service. O.J. Simpson Enters No-Contest Plea. Los Angeles Times. May 23, 1989. On May 24, 1989, O.J. Simpson received a suspended sentence, twenty-four months of probation, and fines totaling $470. He was ordered to “perform 120 hours of community service through the Voluntary Action Bureau” and to receive counseling twice a week. As Mr. Simpson resided in New York City between the months of August through January due to his broadcasting responsibilities, Howard Weitzman and prosecutor Rob Pingel arranged for Mr. Simpson to receive his counseling from a private psychologist rather than require him to participate in the group counseling sessions prosecutors traditionally preferred. The Judge also ordered O.J. Simpson to pay $500 as “restitution,” to the Sojourn Counseling Center, a battered women’s shelter in Santa Monica, California. May 24, 1989 Los Angeles Times article detailing the terms of O.J. Simpson’s sentencing. From his first conversation with LAPD Detective Mike Farrell on January 3, 1989, O.J. Simpson took complete responsibility for the reprehensible, disgusting physical abuse he committed against Nicole on New Year’s Day 1989. O.J. Simpson fulfilled all of the terms imposed on him by the criminal justice system to the satisfaction of Judge Ronald Schoenberg. In addition to the requirements imposed on him, O.J. Simpson took significant personal and legally-binding actions in the wake of his behavior on New Year’s Day 1989. We will explore this in-depth in the fourth part of this series. This is the second part of a multi-part series investigating O.J. Simpson’s History of Domestic Violence. Part three of this series will examine the claim that prior to the New Year’s Day 1989 incident, LAPD had responded to eight other domestic incidents between O.J. and Nicole Simpson. O.J. Simpson and Domestic Violence Part 3: Did LAPD Respond to 8 Domestic Violence Incidents Between OJ & Nicole?